dessert trio | Is there any wine left? 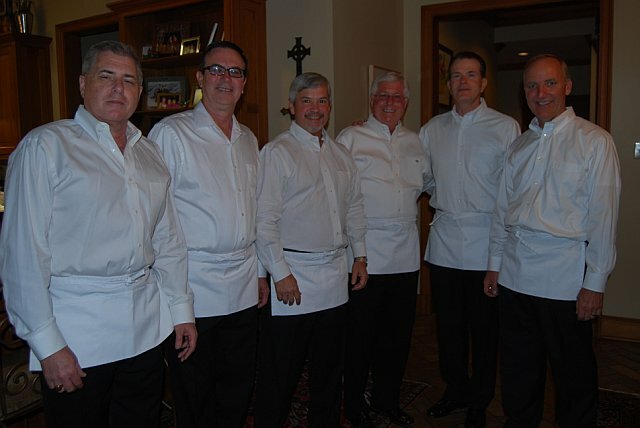 Remember how I mentioned in the last post that the men were the servers at the auction dinner? Look how great they look! The ladies plated everything absolutely perfectly — like at a gourmet restaurant. Each course looked fabulous but I think the desserts really stood out! Wouldn’t you be so excited if this came to your table?! 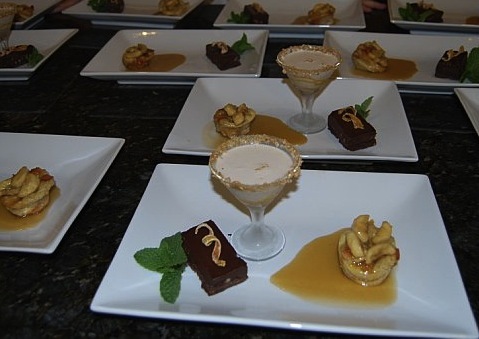 On the left is a dark chocolate and orange tart, in the middle is a crème brûlèe martini, and on the right is a bananas foster bread pudding. For Crust: Using electric mixer, beat butter, sugar, cinnamon, and salt in large bowl until smooth. Beat in cocoa powder. Add flour and beat until dough comes together in moist clumps. Gather dough into ball; flatten into disk. Wrap in plastic and chill until firm, at least 1 hour up to 1 day. Roll out dough between sheets of waxed paper to 11 inch round. Peel off top sheet of paper. Invert dough over 9-inch diameter tan pan with removable bottom; peel off paper. Gently press dough into pan. Press dough overhang in to form double-thick sides. Pierce dough all over with fork. Refrigerate 30 minutes. Using sharp knife, gently loosen crust from pan sides. Remove pan sides. Cut tart into wedges; serve cold. Combine vodka, Kahlua and heavy cream in a martini shaker with ice. Shake and pour into martini glass rimmed with caramel and toffee bits. Put the torn pieces of French bread in a large bowl. In another large mixing bowl, combine the eggs, granulated sugar, milk, vanilla, and cinnamon and whisk until well blended. Pour egg mixture over French bread and let it sit until all is absorbed up by the bread. Bake the pudding mixture for 35 minutes, or until the pudding has turned golden and set in the pan.